and? he got benched for a 4 star kid and transferred from Ole Miss. I'm talking about starting a once in a decade talent Lawrence over a QB who many clemson fan's already didn't like. You didn't see Clemson fan's crying about him getting benched. Much like if Mccaffrey walks out vs Middle Tenn St next year no one will shed a tear for Shea. the other 2 were 3 way ties 1 Time 3 2 loss teams in which we lost to the other 2.. and the other x-1 x-1 x-1 Both of those Michigan was not the BCS representative and "lost" the tiebreakers . and had an average of 3.33 losses a year in Carr's career. 2 outright big 10 titles in 13 years 3 Splits where 2 of them would have Michigan have not been the Representative in the Big 10 title game if we had one and were not the "big 10 representative" in the BCS. That's like counting that Harbaugh was the Co-East champion this year. In Old rankings Harbaugh would have "won the big 10 title" the same way Carr Split 3 of them. This is a little off topic. OSU family members are saying Harbaugh is classless for not shaking Mullin's hand after the game. I had already deleted the game. Help me with the argument, I thought I saw the coaches meet after the game. You can cherry pick the stats all you like but the fact is, Harbaugh hasn't accomplished much unless 10 win seasons and losing to OSU and losing bowl games every year is the bar. Meanwhile, we're heading into year 5 and we still don't have a dependable offensive line (Warinner did a good job but still), any real or explosive playmakers on offense (the RB's are serviceable but far from great, the WR's are good but not game changers, and Patterson was an upgrade but has some glaring holes in his game). Compared to what we saw on the field last night? Not even close. I tried to imagine Michigan playing any one of those teams last night and it was frightening. If you're going to run a predictable, plodding offense then you'd better have some game changers on the field and we don't. And there is no way in hell Harbaugh is going to overhaul this offense so I would anticipate more of the same next year. A year that will absolutely require us to lean on our offense as our D loses a lot of talent. 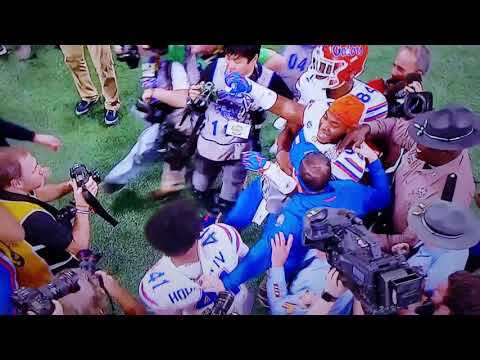 Classless Florida Players more like it. They were just a better team. At the end of the day, they seemed like they had us. … They knew what we were in and how to manipulate it. Seems pretty obvious he's talking about the defensive scheme. If you'll recall it took the Gamecocks about 3 quarters to adapt to Brown's scheme in UM's last bowl game before they could start exploiting it, scoring 23 points in the last 18 minutes of the game for the win. Michigan is bubble team. Close to being really good until the bubble pops, like it did at the Shoe. They need some fresh air, and ironically enough, the perfect candidate to help is Fisch. Not sure it will happen, but I’d be one happy camper to see JF back in Ann Arbor.